For most Americans, the idea of being able to sit and relax in the comfort of your own backyard is a treat. When this activity is done from a covered, sturdy deck, the results can be even better! Since 1983, Virginia Decking & Remodeling has been providing plans as well as deck installations to thousands of happy customers. Our deck designers and builders have years of experience, making us a top choice among professional deck builders in Fredericksburg and beyond. If you’re looking for the plans to do it yourself or require a full installation, our deck company is ready to help! The magic and enjoyment surrounding a deck is entirely dependant on the user’s plans and preferences. Today, we’ll look at a few considerations for homeowners looking to improve their property’s enjoyment. We can take care of the details and hard work, you can focus on creating the custom deck of your dreams! The dimensions of your deck will depend on a few factors. For one, the size should be a compromise between functionality and purpose. One mistake people often make is placing the edges of their deck close to windows and doors. While you can still enjoy the deck, the aesthetics will be off. Another aspect is the deck railing systems keeping your elevated surface safe. People who improperly size their deck will find that their window view to the outside world will be impeded by a railing. Sizing also comes into play based on the function of your home’s deck. Many Americans are looking for an exterior dining space or simply a space to relax in. Designing a deck that is too small will create a variety of future problems for you and your guests. Overcrowding can also be a hazard for occupant safety. Conversely, building a deck that is far too expansive can have its own issues. The biggest drawback here (besides structural feasibility) will be the excess cost. Virginia Decking & Remodeling wants to provide customers with the absolute best value. In fact, we offer deck framing services where our crew will take care of the gritty construction, leaving you with the fun part. We’ll work with you to make sure that your new deck is the ideal size to best suit all of your recreational needs! Placement also plays a major role in deck design. Since most citizens utilize their deck for outdoor meals, it is often desirable to place the decking system adjacent to the kitchen for easy access. The location of your deck should take several factors into consideration, from cooperating with existing landscape features to providing an easy entry point into the home. Looking for a beautiful view of the countryside? Eager to watch the sunset from your new deck? The homeowner holds the power when it comes to creating an enjoyable space or one that missed the mark. Safety and structural integrity play heavily in this process as well, so it’s important to do it correctly. Proper planning for your deck placement will pay off big once the sawdust has settled. Virginia Decking & Remodeling is comprised of your go-to professional deck builders for Fredericksburg residents and beyond. 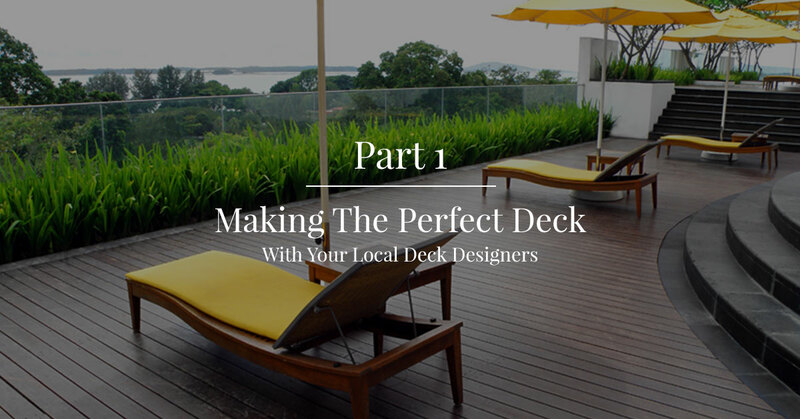 While we provide excellent deck designs, it’s important to create the perfect deck for you. Next time, we’ll go over a few more components to consider when designing your dream deck. Contact us today to learn more or to quote your next decking project!